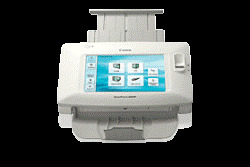 Canon-ScanFront-220P-Scanner Ultra-compact,streamlined network scanner with touch screen. Fast,high quality scanning up to 26 pages per minute (35 ipm) (A4/LTR,B&W,200 dpi) - Large 8.5 in. Colour touch screen - Scan directly to PC folders, e-mail, FTP, and USB memory - Personal and shared address book, plus custom JOB button shortcuts - Easy remote scanner management. Personal and shared address book, plus custom JOB button shortcuts. 8.5" x 14" / 2" x 2.12"